Using lens filters on your drone camera for landscape aerial photography will bring the quality of your images and video to the next level. You just need to know the basics of how they work and have a solid understanding of what types of filters you can get. Add some drone filming practice using lens filters and your aerial landscape photos will catch the eye of many admirers. When you’re producing great photos using lens filters, then you can enter some great aerial photography competitions. One of these is the Skypixel Competition run by DJI. The prices are pretty awesome. To grow your knowledge even further on perfecting your camera settings, visit our aerial photography section. If you are looking to upgrade to the latest drone which have the latest and greatest cameras for aerial cinematography, then checkout this top drones with gps and 4k camera article. Lens filters have been widely used by both amateur and professional photographers since way before digital photography arrived on the scene. Many people who work a lot with photo software know about filters from these applications such as Adobe Photoshop, Lightroom and Instagram to name a few. These applications try to emulate the look and feel of certain types of lens filters through digital means in post-production. It sometimes works, but mostly doesn’t. Real lens filters are attached in front of the lens, so that they alter the light hitting the camera sensor. There are all sorts of lens filters: some enhance colors, while others reduce reflections, block the UV light, or allow you to capture mesmerizing infrared photographs. Whatever the case is, the most important thing you need to remember when using lens filters is the fact that they change the way your camera sees the scene. It also means that you need to adjust the settings on your camera accordingly to get a good exposure. Camera filters are often categorized by the way they attach to the lens or the effect they give to your image. Screw-on filters come in different sizes, corresponding to different camera lenses. A lens with a 52 mm mount can only work with 55 mm filters. If you have multiple lenses of different sizes, this type of filters can end up costing you a lot of money. The second type of filter is in the form of a sheet of glass, which slides into lens adapters. The glass itself can be used with adapters of all sizes, and the adapters are fairly inexpensive. Now, you can also subdivide filters according to their shape. The most common type are circular filters, but you can also get square and rectangular filters. Filters are also made with a specific camera in mind. 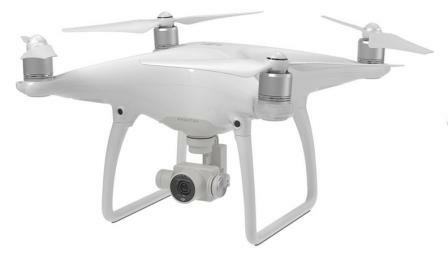 For example, many drone gimbals are made with the GoPro Hero 4. 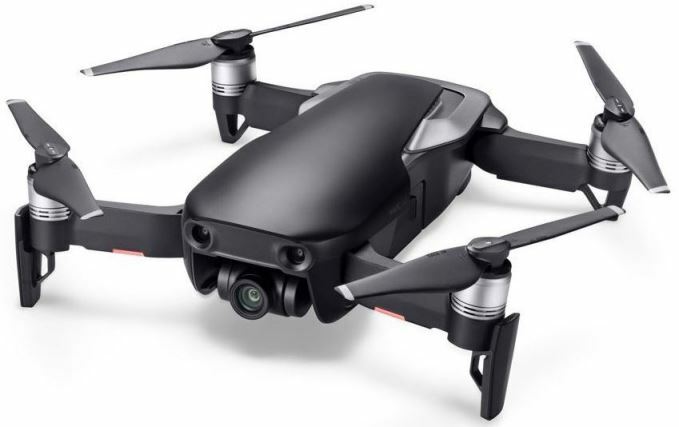 In fact 3DR designed their SOLO drone specifically for the GoPro Hero 4. You can buy many kinds of lens filters, but only some of them are widely used for landscape photography. These include UV filters, which improve clarity and provide additional lens protection. There are also special effects filters such as the infrared filter, which dramatically alter the appearance of a scene to create unique visual effects. When working with camera filters in the beginning, take you notes of what each filter does with you. Practice with each filter. After a short while, you will know exactly which filter you need for each landscape. Think, plan and try to vision the type of scene you will encounter before you fly. If you plan, you will know what filter to attach to your drone camera. A neutral-density filter, or ND filter, preserves colors, while modifying the intensity of light. Photographers use to take perfectly exposed shots in situations where they would otherwise be forced to stick with a certain combination of aperture and exposure time. The most common example that comes to mind are photographs of rivers or waterfalls under bright sunlight. 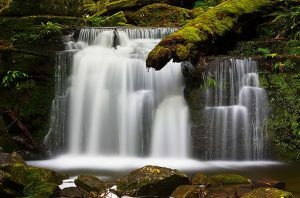 A neutral-density filter allows for a long exposure time, thus creating a stunning effect of running water. The Waterfall picture above is the work of JJ Harrison which shows the beautiful effect of using an ND filter. A graduated neutral-density filter, also known as a graduated ND filter, is very similar to a neutral-density filter. The only real difference is that the GND filter has a variable light transmission, making it extremely useful for pictures that include a brightly lit horizon with a darker landscape. The filter evens out the scenery and prevents the sky from being overexposed and the landscape from being underexposed. Graduated neutral density filters are also known as ND Grads. Here is another terrific article with videos to expand your knowledge on graduated ND filters. This type of filter does exactly what its name says: it changes the color temperature of the scene, which can be used to add a bit of warmth to a cloudy landscape or to correct an unrealistic color cast. Warming and cooling filters effect the white balance in the photo and most DSLR cameras today have the feature to automatically adjust the white balance. However, some situations may still call for color filters, such as having to deal with unusual lighting. If you are shooting in a RAW file format, you might be tempted to skip this filter and adjust the color temperature during post-processing, but you are risking introducing noticeable image noise in certain color channels. More information on the various warm / cool filters below. A polarizing filter is a must-have tool for landscape photography. It is typically the first filter landscape photographers buy to instantly improve their pictures and and add vividness and contrast to them. Polarizing filters suppress glare and reflection from many surfaces such as lakes, rivers, sea, glass and even book spines. This filter can also darken a blue sky. It also reduces the reflection of sunlight coming off shiny leaves if you were filming green vegetation in sunny weather. It does this by reducing the amount of reflected light that passes through to the camera sensor. What you get as a result is a noticeably improved saturation and subtle changes to the balance of the light in the picture. For all normal lenses which have a filter thread in the front, you can get a circular polarizing filter, also known as a “circular polarizer”. A circular polarizer is very easy to use and once you attach it on the front of your lens, all you need to do is rotate it clockwise or counter-clockwise to get a different amount of polarization. See video at the end for a really terrific explanation regarding polarizing filters. While you may rarely use a close up filter while doing aerial photography, it may be just well worth having a set for that once in a lifetime shot. Close up filters can generally be bought as a separate kit. A close up kit generally include 4 close up macro filters of increasing magnification such as (+1,+2,+4,+10). These close-up macro filters allow for detailed close up macro shots of small objects such as insects, coins, flowers, etc. They also have a stack-able design so you could combine filters to achieve maximum magnification. For example, +2 plus +4 will become +6. 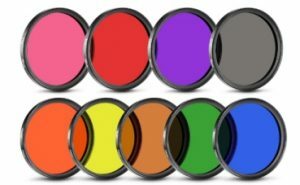 Lens filters are a wonderful way how you can greatly enhance the overall quality of your landscape aerial pictures. Try out the various lens filters at different times of the day and find out the filters which complement your aerial photography. Over time your knowledge will build until you become a real lens filter professional. Next up is a terrific video on using polarized lens filters which are so very important in aerial landscape photography. Yellow Contrast Filter – Gives a subtle contrast boost and is recommended for landscape and foliage. Red Lens Filter – Darkens blue creating dramatic contrast between sky and clouds. It also creates greater contrast between flowers and foliage. Blue Blending Filter – Designed for bright contrasting landscapes. Selectively add blue color more precisely than polarizing filters for most natural hues. Purple Lens Filter – Helps with aerial photography optical resin to provide real sharpness to photos. Light Green Filter – Darkens sky in contrast to clouds. It is a basic contrast filter, primarily for use with black and white film. Orange Len Filter – Generally can be used for landscape and architectural photography on black and white film. Originally intended for use with black and white film, this filter absorbs blue and blue greens and renders blue tones darker as in marine scenes. Now to finish this post, here is a terrific video which some great practical examples on using various lens filters for landscape photography.